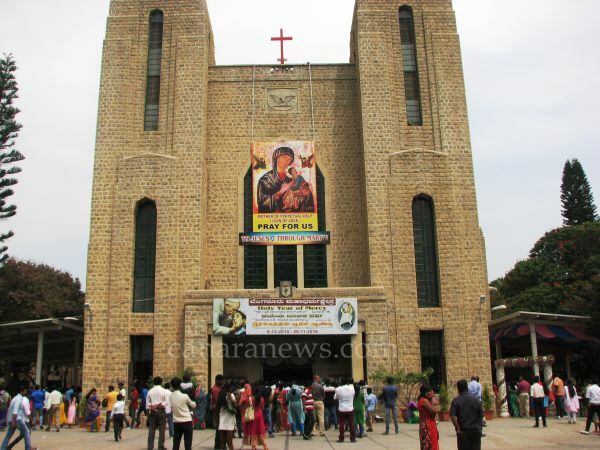 Bengaluru, Oct. 23: Archbishop Bernard Moras of Bengaluru called upon the people to go to Jesus (and God) through Mary as we believe in the perpetual intervention of Mary. Dr Moras was speaking during a concelebrated Mass at Holy Ghost Church near here at the conclusion of the five-day devotion to and veneration of the icon of Mother of Perpetual Succour. Archbishop posed a question as to why not to go direct to Jesus and God. Jesus is God himself. All are welcome to go to Jesus (God) directly. Mary was chosen to be the Mother of Jesus (God). Archbishop Moras illustrated this aspect by an allegory. When a child wants something, it always goes to its mother first as the child is not grown and not capable of thinking in a mature way. This is applied in our spiritual life, strengthening the faith and in our striving for salvation. 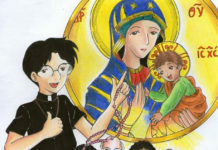 St. Luke noted the role Mary played in the salvation In 19th century. Sharing a reflection on the day’s reading, Rev. Dr Moras asked what mistake the man in the parable (of Pharisee and publican in the gospel) makes. The Pharisee was self-righteous and viewed others with contempt. The attitude was self-righteousness. He compared himself to others and was very condemning of others. The Pharisee made the wrong conclusion in his comparison between himself and the tax collector. The Pharisee was unaware of his own sins, but very aware of other peoples’ sins. This is very characteristic of a self-righteous person. On the other hand, the Publican was the least respected member of society. He was a Jew who went to work for Rome collecting taxes. He was viewed as a traitor. He stood at a distance. He was afraid to approach God, knowing that he was unworthy. He was unwilling to lift his eyes. This showed his humility. He asks for mercy from God. He says, “Be merciful to me, the sinner.” That is genuine humility. He literally says, “Be merciful towards me.” He knew that only God could help him to be righteous. (Rom 3:23-25) Jesus Christ was the answer to this man’s prayer. Justification is that gracious work of God whereby He extends mercy to the repentant sinner who comes to Him in faith. The publican went out in peace, his sins forgiven. The Pharisee did not understand that only God could help him to be righteous. Elaborating on ‘Mercy’, the Archbishop said, on September 4 this year Mother Teresa was canonized and she is a great Saint. He made a mention of her work of mercy among the poor and the needy. He urged all present to compare our work with hers so as to get a feel of her devotion and commitment towards helping others. This brings God’s blessings. If everyone speaks well of you, it is a sign of grace of God. Service of others should be utmost in our minds. He encouraged all to be humble like her. Saint Mother Teresa was humble before God. She felt she was no one (before God). Taking into account the day’s parable in the reading, Saint Mother Teresa’s example and each person’s life, we have no humility. We take credit for ourselves for all that happens. Our ego is so high and that ruins all. Archbishop cautioned people who could be like the tax collector and the publican in the work area and business field. We could be like a pencil in hand. Learn to be good example to others particularly in work area and apply righteousness for life to change. Need should be felt to seek God’s grace in this year of Mercy and to establish good relation with God and fellow beings. Archbishop Moras who was, earlier, welcomed by the parish priest, Fr. 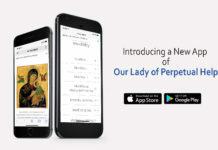 Paul Pazhangattu CSsR, on his reaching the church, said “we are here in a special way – to honour the icon of Mother of Perpetual Help. 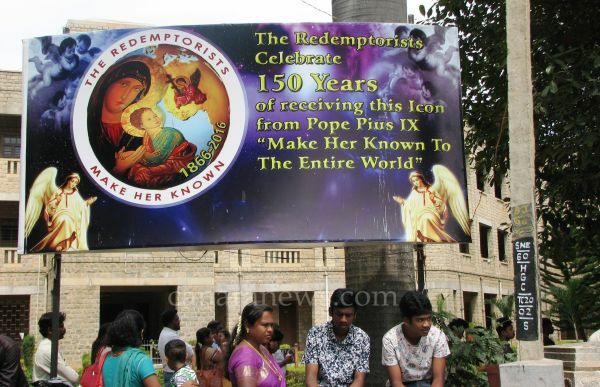 The occasion is the jubilee of 150 years of the icon of Perpetual Help with the Redemptorists. The Pope has blessed 60 pictures and sent to the whole world to show that she deserves the special veneration and honour, and that God bless all (who honour her). Soon after the Mass, the parish priest presented the Archbishop with a bouquet to greet him for his 75th Birthday celebrated recently. Parish priest Fr Paul also proposed a vote of thanks in which he thanked the Archbishop and all others who contributed towards the celebrations, including the priests from near and far. Among others present included Fr. 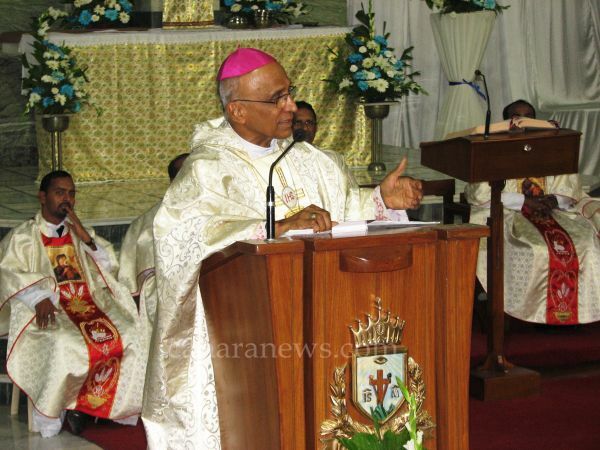 Jacob Britto, former parish priest and Secretary to Archbishop. 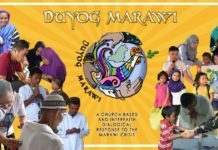 Parish priest invited people with their members of families to spend some time in fron of the icon to pray and meditate. Multitudes of devotees thronged to venerate the icon and to pay obeisance to ‘Our Mother’ since October 19 through Sunday – whole day and night and till Monday (Oct 24) 8 am. 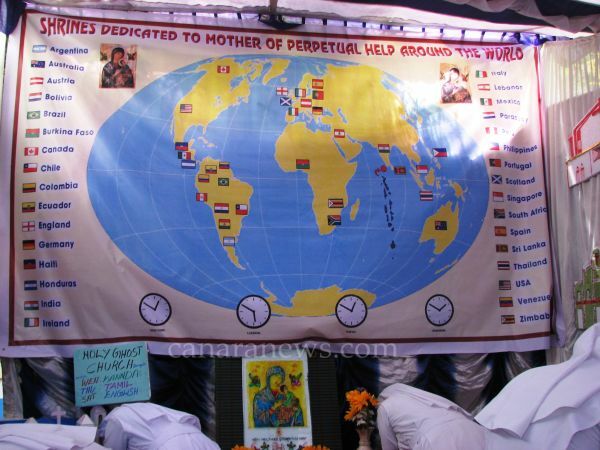 Several stalls were put up to explain to people the history and all aspects of the icon besides the miracles, favours and the benefits people all over the world received. The icon is expected to be taken to Kerala on Monday, it is learned.